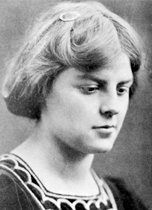 Rosamund Bland was born in England.1 Her father, Hubert Bland, and mother, Alice Hoatson, were not married but lived in the same household with Bland's wife, Edith Nesbit, a writer of children's literature.2 Hubert and Edith were among the founders of the Fabian Society; they adopted Rosamund and another child of Hubert's conceived with Alice outside of the marriage. Orage introduced her to P. D. Uspenskii in November 1921, when Uspenskii first came to London to give talks on the Work.5 She immediately attracted his attention and joined his group. They had frequent private meetings and she eventually became his secretary. 1. Genealogy webpage of John Blythe Dobson. 2. James Webb, The Harmonious Circle (New York: G.P. Putnam's Sons, 1980), 222-23. 3. Solita Solano Archives, Library of Congress. 4. Sharp was the first editor of the New Statesman magazine from its foundation in 1913 until 1928. 5. Rosamund Bland, Extracts from Nine Letters Written at the Beginning of Ouspensky's London Work in 1921 (Cape Town: The Stourton Press, 1952). 6. The Gurdjieff Journal, Number 49, 17.